The files are stored in the directory \IXI-UMS Business\ixi-UMS Kernel\DB\Archive. Like the journaling database, files older than 30 days are moved to a backup directory every first Day a month. If the e-mail-sender adress of the outgoint UMS message is not find in the ldap user database, the UMS messages are deleted and the default recipient is notified. 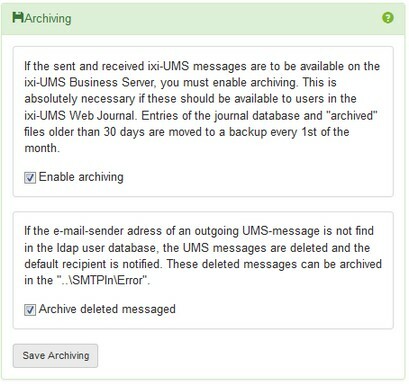 Optionally, you can archived the deleted UMS message in the installation directory ...\SMTPIn\Error.